The Messenger Is The Message, the first book by Influitive CEO Mark Organ, outlines a revolutionary shift in marketing, where customer advocates are the primary driver of business growth. This new movement is called advocate marketing, and it’s the subject of The Messenger Is The Message, the most comprehensive guide to using the voice of enthusiastic advocates for fueling business growth. Today, buyers are constantly bombarded with demands on their attention. They contend with news feeds and apps clogged with ads, mobile phones flooded with robocalls, and email inboxes and social channels filled with sales pitches. It’s no wonder that engaging prospective customers—and earning share of wallet from current ones—is so difficult for companies. A new generation of marketers are succeeding by eschewing the impersonal, machine-based approaches to winning new business. They systematically surround buyers with the transparency and authenticity they crave through messages that come from a trusted source: other customers. 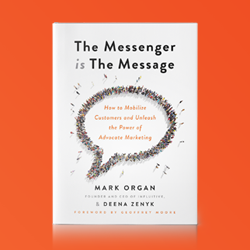 Written by Mark Organ (founding CEO of both Eloqua and Influitive), and co-authored by Deena Zenyk (Influitive’s Director for the Centre of Excellence), The Messenger Is The Message has become a best seller in the Marketing category on Amazon.com and Amazon.ca within its first month of release. The Messenger Is The Message provides companies with a blueprint for building a community of advocates, including the top factors that influence authentic advocacy. The book also has real-life success stories of some of the most innovative businesses in the world—from startups to global multi-nationals—who have harnessed the power of advocates. To purchase a physical or digital copy of The Messenger Is The Message, visit Amazon.com. Learn more about the authors and the book on themessengeristhemessage.com. About the authors — Mark Organ is a pioneer in the field of B2B marketing, having founded Eloqua, the world leader in marketing automation software, which was acquired by Oracle in 2012 for $871M. Today, he heads Influitive, the world’s first platform dedicated to scaling B2B customer advocacy. Deena Zenyk is a world-leading advocate marketing expert, with more than 12 years of experience in the space. She has helped many of the world’s largest companies—including Cisco, IBM, Oracle, Salesforce, and VMWare—to launch successful advocate marketing programs. About Influitive — Influitive is driving the shift from company-centric marketing to advocate marketing. Its advocacy platform, AdvocateHub, and team of experts help the world’s most successful businesses discover, nurture, and mobilize their greatest marketing asset: their customer advocates. To learn how Influitive makes accelerating sales revenue and increasing customer lifetime value easier and more predictable, visit http://www.influitive.com.